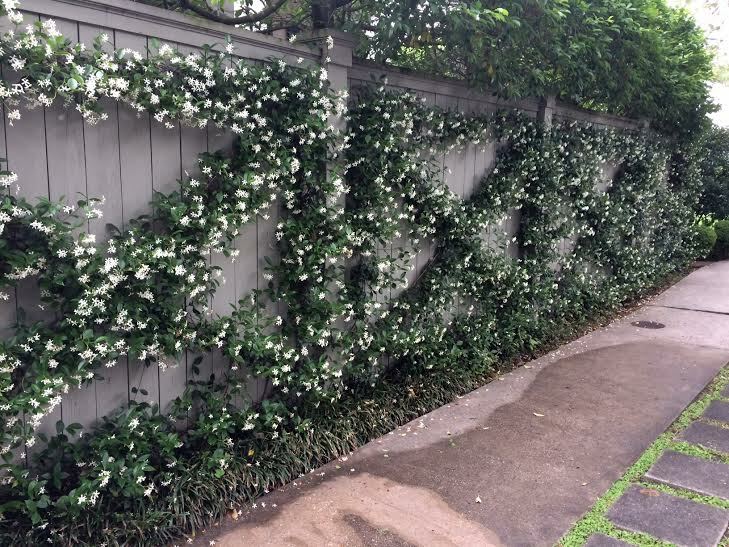 Along my afternoon walks, the scent in the air these days is the sweet scent of Confederate jasmine. 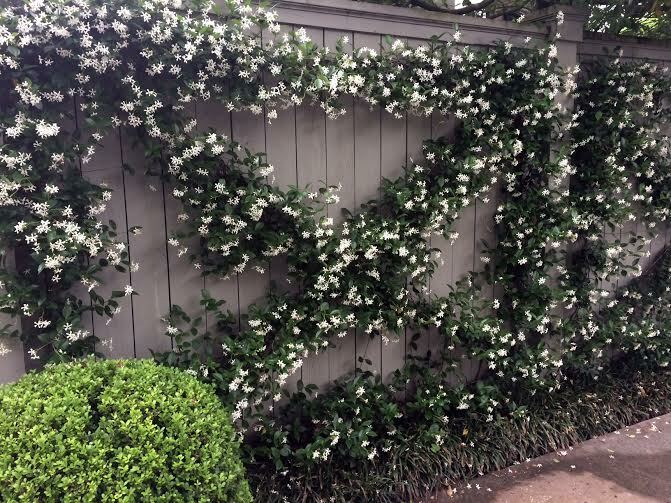 Climbing up walls, trained on trellises, or just growing up lamp posts, the scent of jasmine is recognizable and invigorating. 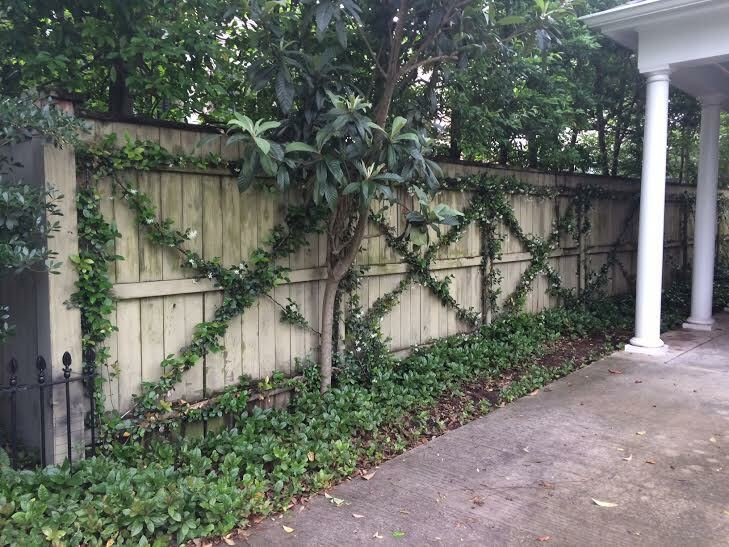 This beautiful and energetic evergreen vine creates a special scene all through the year as clambers 40 ft (12 m) up tree trunks using its holdfast roots to pull itself almost to the top. 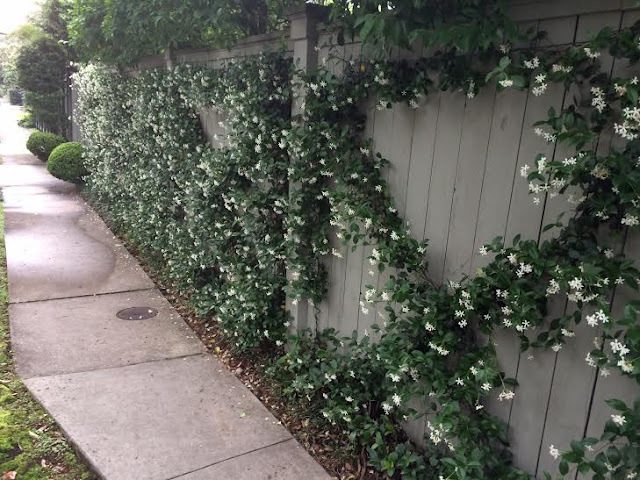 During April and May the plant goes two-tone as it flushes light green with new growth. Shortly thereafter the scene transforms again when the delicate 1 in (2.5 cm) white pinwheel flowers delicately breathe enchanting fragrances into the spring air. Confederate jasmine grows as a neat tangle of slender wiry stems that exude white latex when cut. These are covered with thick glossy evergreen leaves that are 2 in (5 cm) long, oval shaped, and pointed at both ends. The stems will twine and clamber over supports and cling to walls and hard surfaces with great ease and abandon. Does jasmine grow in your neck of the woods? 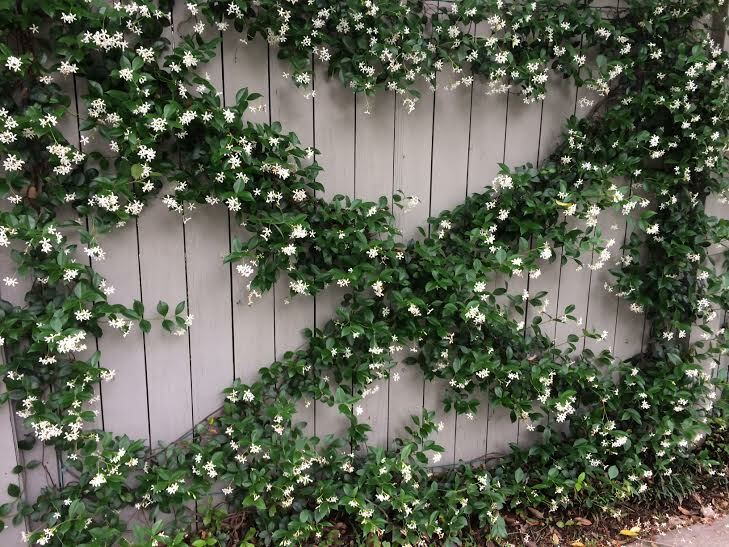 I love jasmine, but alas I don't see it around here much. Oh how beautiful Ron and I know the smell is wonderful. I have Cape Jasmine vine and it really smells divine and the entire neighborhood too. 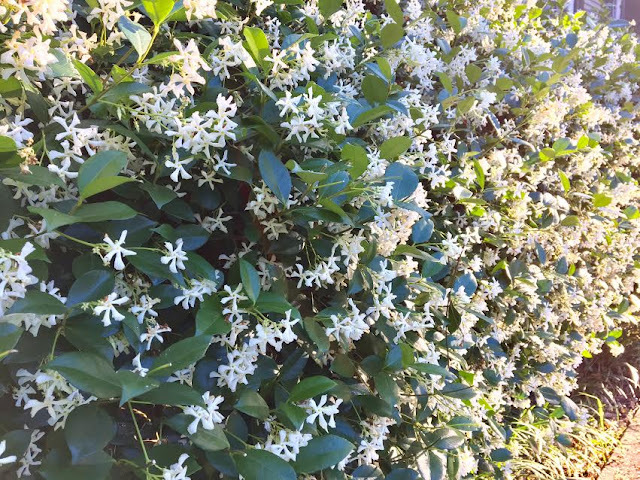 I also have a Night blooming Jasmine bush that smells great and blooms twice a year. Oh, that would be lovely! 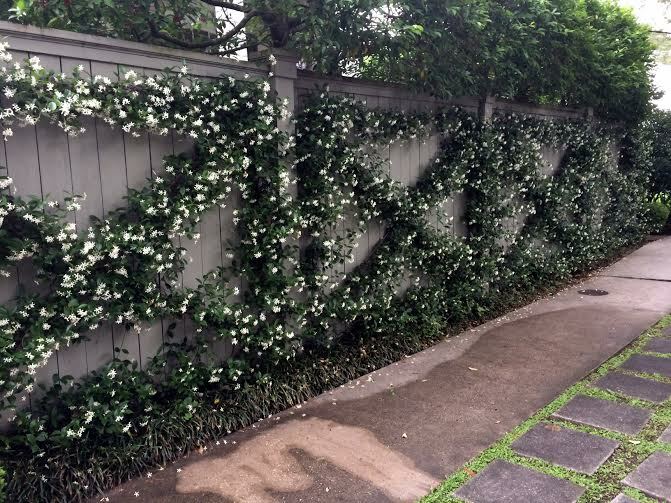 Love the way it is growing on the fence. 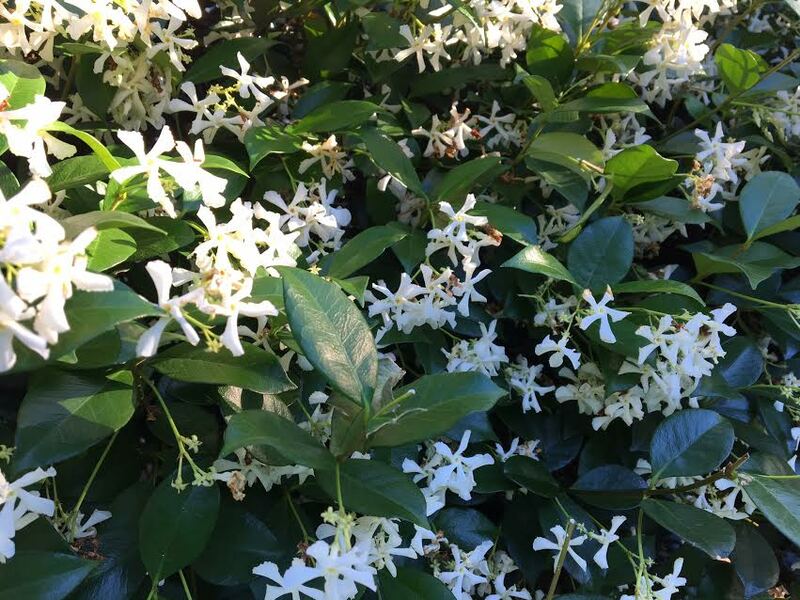 No jasmine for zone 5...only plants I can smell now are the lilacs. I have one plant the size of a small shed in my backyard.